Lesson – You can’t defeat possessed objects. Hi kids – it’s been a while! I was on vacation, and I regret nothing. Incidentally, if you happen to want to hire an industrious 24 year old MS Print Media student, you should uh…you should let me know. I went to see Oculus this week, a week late I know. I don’t always get to the theaters to see new movies, and since my column gets published on a Friday it messes with the release schedule a bit. 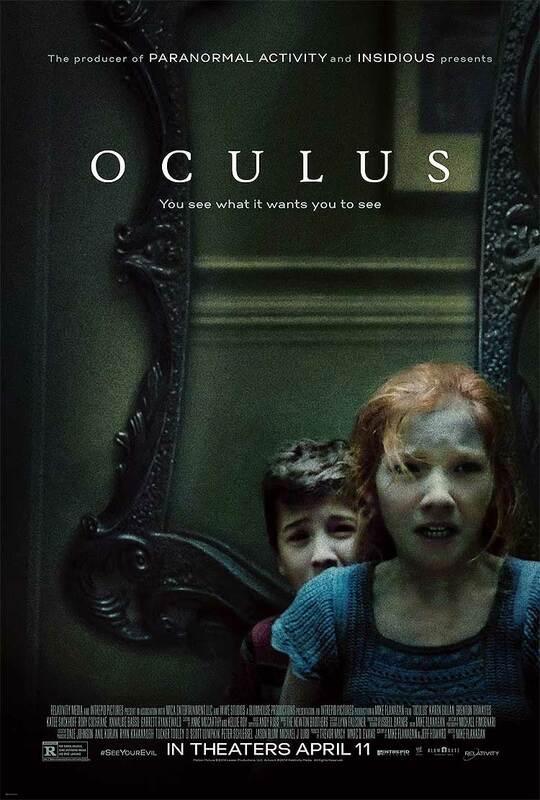 In either case, I’m very, very very glad I took the time and money to see Oculus, because it was FANTASTIC. Okay, I don’t want to oversell it–it wasn’t perfect, but it was close. The basic plot is Amity-horror-esque, where a possessed object infiltrates the sanity of its surroundings, and, obviously, crazy things ensue. A family acquires an old mirror, and the remainder of the film centers on the disintegrating family and modern day Kaylie and Tim (Karen Gillan and Brenton Thwaites, respectively) trying to prove the mirror is in fact haunted. The result is an Escher-like adventure through visual deception as the lines blur between what the mirror wants them to see and what is actually happening. The father, Allen (played by Rory Cochrane), begins to go first, as the mirror is in his office. His normally pseudo-stern father act bleeds into the acts of a man who is emotionally distant and consumed. “I never said he wasn’t seduced, it’s a question of what seduced him.” screams Kaylie in one of the modern-day arguments. The mother (Katee Sackhoff) loses her sanity at first in a normal ‘my husband is probably cheating on me’ sort of way, and then succumbs to the same possession. Now, for me, beyond the nuances of layered mis-direction, perception mistakes, etc., the actual scariest part of this film is the parental betrayal. Kaylie and Tim are about 12 and 10 years old, and they are suddenly forced to cope with their father growing stranger and stranger, their mother growing more fragile and distraught. Since this is a horror movie, this actually escalates quite severely and leads to the father imprisoning the mother in their bedroom and torturing her/leaving her to her insanity. Kaylie is confronted with this, and it’s like, the scariest thing. Seeing your parents vulnerable is already pretty terrifying, and escalated to this point, being forced to act against it but still ending up ultimately helpless, that is horrifying. The score is minimal, and as per horror-movie standards I was much more aware when there was no music. To its credit, Oculus didn’t rely too heavily on visual “jump” scares, and the tension was pretty much constantly present. Gillan and Thwaites do a pretty fantastic job, as do their younger counterparts, and everyone’s chemistry was seamless. 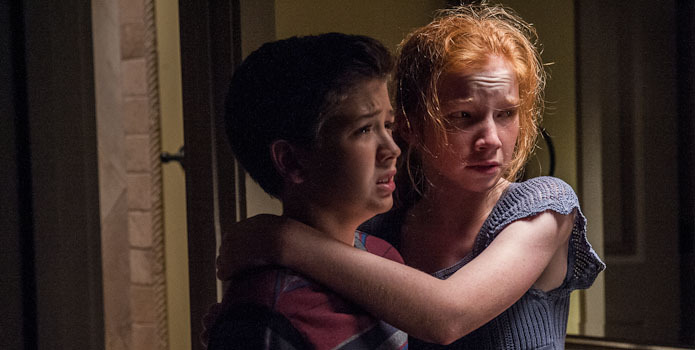 This is pivotal to family thrillers–it can really make or break a movie like this. My only complaint, and I do mean only, is the overt presence of the mirror-people, aka the various souls the mirror has ‘consumed’. They are very physically there, which is fine because, optical illusions, but their eyes were mirrors. At a glimpse this is a nice gimmick, but for the longer shots it’s kind of jarring in a non-scary way. Either way, there were definitely times I jumped a little, or watched through squinted eyes, etc. It was really wonderfully executed, with the perfect amount of horror standards and fresh looks. A great blend of old and new. Highly recommend! Great review. I don’t think we have a release date yet for this one in the UK but I’ll definitely be watching it when we do!